There you are, you’ve finally decided to pop the question. All that’s left is to purchase a ring and plan how you’re going to ask. You thought the hard part was to commit to a relationship, but then you go into a jewelry store and you ask them to show you engagement rings. First question they ask you is what style/setting would you like. Seems simple right? With so many choices of styles and settings it can become overwhelming. First you must choose the setting, which is really important because that’s what the diamond will be sitting on. Then you have too decide on a diamond cut and shape. 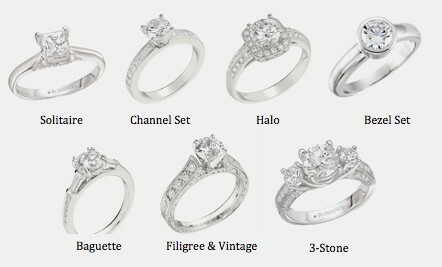 Below is a list of different engagement ring styles and settings to help make this magical time easier and more smooth. The Tiffany setting is a 6 prong setting solitaire that has been trademarked, which makes it impossible to purchase from anywhere besides their store. Of course you can find different variants of the same design at other jewelry shops, but nothing that is an exact replica. Pave’ is a French word, which means “to pave”. This is an accurate description of this ring setting. This setting makes the diamonds look like they are a trail of endless sparkle. This is a great choice if you want the beautiful sparkle of diamonds, at a lower cost. Since the diamonds are smaller it is a more affordable ring. You get the shine without wiping out your bank account clean. This setting is the exactly what you would imagine. A group of small diamonds surrounding a larger diamond in a circular shape. This setting is a great option if you have a small center diamond which will accentuate the larger diamond, making it seem larger. 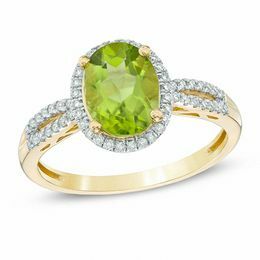 This is a great way to purchase an affordable ring that sparkles with a less carat diamonds. This setting has no prongs or anything to hold the diamonds. They diamonds are placed between a metal channel. This is a great way to showcase the diamonds no stop around the ring without anything separating them. A bezel setting style ring takes the diamond and surrounds it with a metal creating a smooth edge around the diamond keeping it safe and secure. This type of setting is the second most popular setting after pave’. It has a unique look that even with the toughest of tasks is safe. This unique setting style ring is called the tension setting because of the pressure the metal band places on the diamond keeping it firmly in place. This style uses lasers to ensure the placement of the metal on the diamond. Even with this technique to hold the diamond in place, more measure of placing prongs or bezel on the sides of the diamond are used. This setting and style copies that of a cathedral, with the way a cathedral uses arches framing the diamond and making sure it is the focal point of the ring. This setting and style portrays a sense of elegance and classical grace. This type of ring uses different types of setting like prongs, bezel, and/or bezel. As you have noticed most of these settings can be defined by their name. Bar Settings set diamonds between bars of metal. This setting is a great choice for affordable rings, as well as safety. The metal bars hold the diamonds securing them in place. This setting is very close to the channel setting. The only difference is that this setting leaves two sides of the diamond exposed unlike the Channel setting that covers all sides of the diamond. This setting is perfect for men, or highly active individuals. With this style the jewelers take the diamond and fit it into the ring, by drilling a hole into the ring for the diamond to sit in. This setting is simple with a classic look, that ensures the highest level of safety in knowing that it is doubtful that the diamond will ever fall out. With that being said the visibility of the diamond does decrease since part of it is inside the ring. 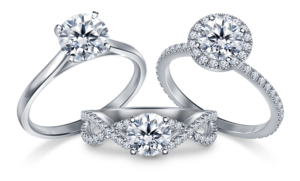 The three stone setting ring which is commonly know as the trilogy ring or trinity ring is really special in what it represents. The three diamonds represent friendship, love, and fidelity. Again with this ring there are more options that a single diamond solitaire ring that is much more expensive. You can mix and match different stones as well as different diamonds, while still keeping it easy on the pocket. This setting is specific to certain eras of time. There are different styles that are portrayed through the different artwork that is shown on the ring. The ring will have delicate metalwork that gives it a vintage look. The rings have a certain Jene Sequa to shows character and elegance. With the cluster setting small diamonds are “clustered” together to look like a large diamond. This can be done with a finish larger stone in the middle or with just a cluster of different diamonds of equal size. This is a great setting since with a lower cost you can look like you have a ring that has a large size diamond that is uniquely presented. This whole article we have been talking about diamonds and what they are sitting on. The shank on the other hand is the part of the ring that encompasses your finger. Most shanks are usually round, however they do come in other creative shapes as well. A split shank is a ring where the shanks split in the middle before encompassing the diamond. This provides a unique style to the ring.